We love Queenstown in springtime. We love Queenstown in the fall. We love Queenstown in the winter when it’s the best place to be in New Zealand. You can go from adrenaline-fuelled fun in the a.m to a vineyard tour at lunch and soaking in a scenic hot tub by sundown. Yep, Queenstown is one versatile holiday hub. Known for being New Zealand’s adventure capital, Queenstown is the ultimate all-year-round getaway. It’s just a skip, jump and a hop from Aussie and a measly two-hour flight from Auckland, so it would be criminal not to check it out at some point. Although you’ll probably want to set up camp and stay there forever, Queenstown is definitely a place you could tackle in a blissful two days. From braving it on the bungy to eating epic burgers and discovering some seriously world-class vino, here’s how you should spend 48 hours in Queenstown. 7pm Ideally you want to touch down in this pretty town in the arvo, but if you can’t slip away from the office, Air New Zealand offer night-time flights from Auckland. The approach towards the airport has been dubbed as one of the most stunning in the world. You fly through snow-capped mountains, massive lakes and meandering rivers—it’s nothing short of majestic. Once you land, it’s time to check into one of the ten snazzy suites at The Spire. Hidden down Church Lane, this hotel is off the charts. Your suite will be decked out in 5-star luxury—a super king bed, a roaring fire and a large balcony for breathing in the fresh, alpine air. 8pm Before you dive into bed, wander downstairs for a bite to eat at The Spire’s restaurant, No5 Church Lane. 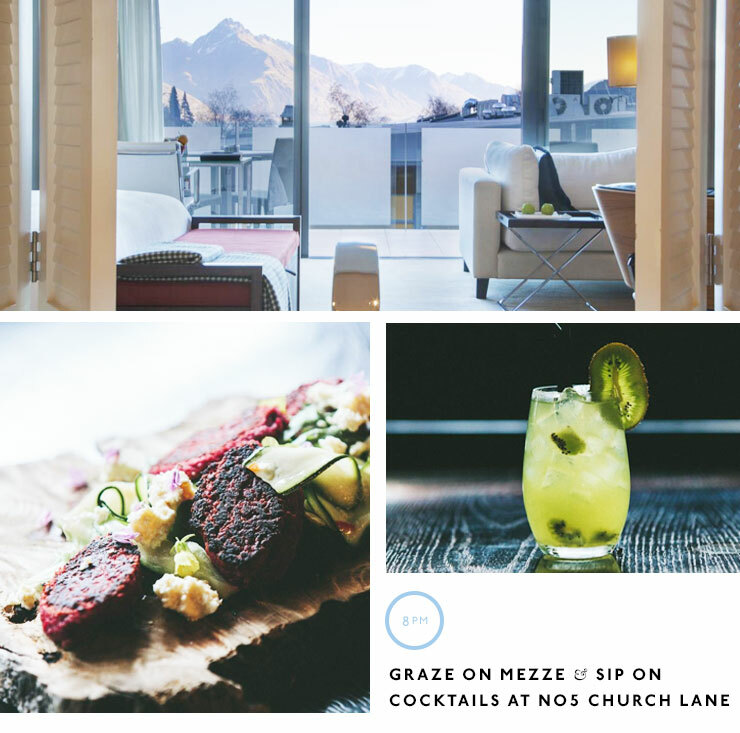 Renowned for its world-class cocktail list, top-notch service and mezze-style cuisine, this restaurant will set the scene for your Queenstown trip via addictive roast beetroot falafel and a cocktail or two. 8am Rise and shine! The lake is right at your doorstep and a leisurely stroll to Bespoke Kitchen is in order. This gorgeous café took out the 2015 New Zealand Café of the Year title—a confirmation that you won’t find better brekkie fare in Queenstown. Their Ōra king salmon with poached egg, beetroot and herb salad, crème fraiche, cashew dukkah and rosti is a standout but if you’re a sweet tooth, the cinnamon spiced pancakes have your name on them. 10am Now that your belly’s full, it’s time to unleash your inner adventure junkie (wait for your tum to settle though—bungy chunders aren’t fun for anyone). If you’re a ski bunny, Queenstown is your mecca. There are four ski fields in the region or, for less snowy thrills and spills, there’s bungy jumping, jet boating, skydiving, zip trekking, paragliding…the blood-pumping list goes on and on. Not an adrenaline fan? Experience the beauty of Central Otago with the Queenstown Hill Time Walk. The three-hour return hike will reward you with a 360-degree view of the area’s rugged beauty. 1pm With all that activity under your belt, you’re probably peckish. A trip to Queenstown isn’t complete without getting your hands on a Fergburger creation. These bad boys have been called the best burgers in the world and usually have lines out the door, but trust us, the wait is more than worth it. Get amongst the Sourthern Swine (Prime NZ beef, streaky bacon and avo) or branch out with Chief Wiggum—a pork belly and hash brown burg of epic proportions. If pies are more your thing, the Fergbaker next door is your one-stop shop for all things pastry. 3pm Let’s call today your ‘adventure day’ and keep the fun times rolling. The Skyline Gondola and Luge is a short walk from town and will see you zoom down Luge tracks before catching the chairlift to do it all again—once is never enough! The views from the top are spectacular and it will only take an hour out of your day. 5pm Have all these activities tuckered you out? Get your chill on at the Onsen Hot Pools, just 10 minutes outside of town. These private, spring-fed hot pools are located high on a cliff with retractable windows so you can take in some seriously breathtaking views. If you’re down for a spot of star gazing, book your pool for later in the evening and watch the sparkly night sky pass overhead. 7pm Relaxed and toasty, settle into the plush couch at Eichardt’s Bar for a Pinot Noir tasting paddle and tapas by the cosy fireplace. 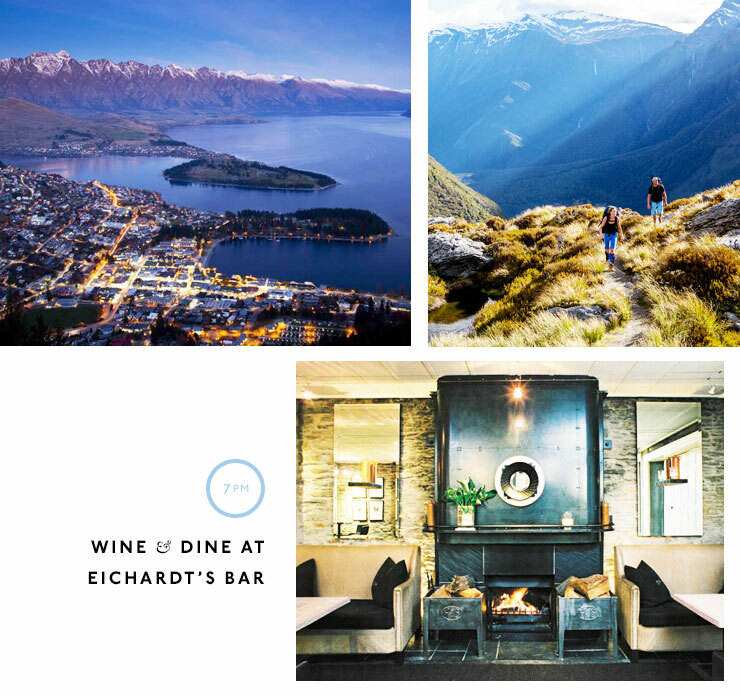 The bar is a Queenstown iconic and a locals’ favourite—you can feel the history and character the moment you step in! Sit back with a book if you’re riding solo or chat away to your travel companion/s over Bluff oysters, pork cheek croquettes and caramelised potato gnocchi. Just promise you won’t leave without ending on the salted caramel and chocolate profiteroles. 9pm Still have some steam left in the tank? Queenstown’s nightlife is worth checking out. Literally chill out at the Below Zero Ice Bar where everything from the walls and seats to the glasses are hand-sculpted by two talented American ice carvers. Or settle in at Bar Up, a hidden gem and self-proclaimed ‘boutique nightlife bar’ just a two-minute walk from The Spire. 8am Your jam-packed day of adventuring is behind you and some well-deserved R&R is in order. Fuel up at No5 with a hearty breakfast and coffee because you’re about to go on a wine tour! 10am Say goodbye to your gorgeous suite and promise it you’ll see it again. The Spire run luxury wine tours with vino tastings at four or more vineyards in the world-famous Gibbston Valley. You’ll learn about the unique history of the region and sip on some top-notch wines at Chard Farm, Brennan Wines and Mt Rosa—just to name a few. If you’re wanting to get up close and personal with the wine-making process, opt for a private experience at the impressive Peregrine Wines. For foodies, a Trust the Chef lunch at Amisfield is also a must. 3pm Your time in Queenstown is nearly up! 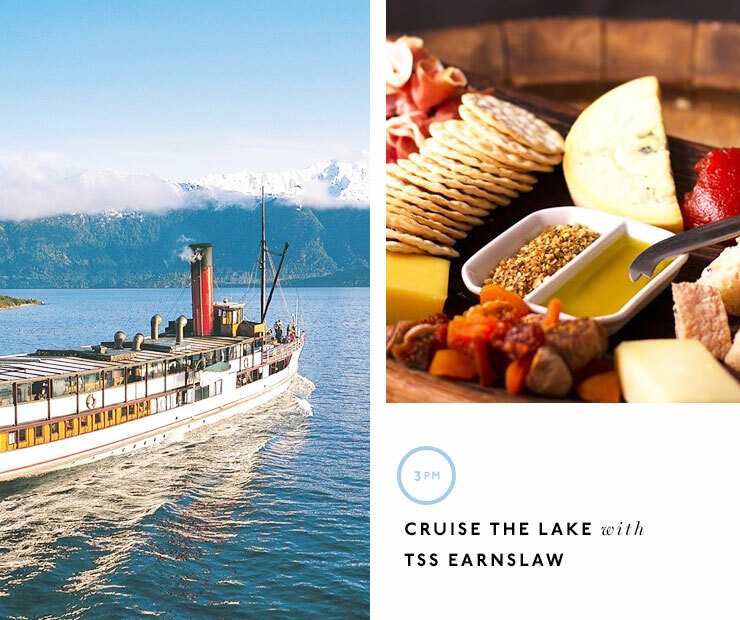 Round-up your wonderful getaway with a 90-minute cruise on Lake Wakatipu aboard the iconic steamship, TSS Earnslaw. Visit the engine room, sing-along with the pianist or simply gawk at the spectacular views from the deck. For a soothing alternative or if you’re in a hurry, squeeze in a quick 30-minute massage at the Millbrook Spa. 5pm Annnd that’s a wrap! Your 48 hours in Queenstown has been a blast but a Air New Zealand flight back home is calling your name. ‘Til next time, Q-town! The weather in Queenstown varies massively. It can be anywhere between 8-22°C in spring, 20-30°C in summer, 12-25°C in autumn and 0-8°C in winter. If you can’t stand queues, you can call ahead at Fergburger! Simply rock up to the window however many minutes later and your burg will be ready and waiting. Queenstown is chock-a-block with foreigners working in hospo, retail or adventure tourism during the ski season. Don’t be surprised if you don’t meet many Kiwis. Naked bungy jumps are a thing. Go on, it’s one for the bucket list. Go to Arrowtown, a gorgeous old mining town just a 20-minute drive from town. Stock up on lollies and homemade fudge at The Remarkable Sweet Shop. Embrace your inner party animal and go on a pub crawl. Brave the cold and take a dip in the lake. Lock in a Lord of the Rings location tour. Olivia flew to Queenstown direct from Auckland thanks to Air New Zealand, and was hosted for two nights thanks to The Spire. Special thanks to Destination Queenstown.